January 20th, 1988. 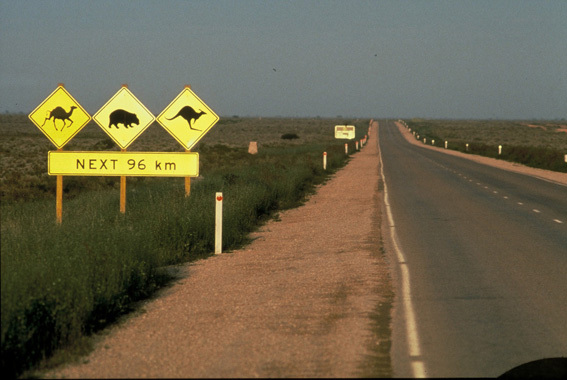 It was four o’clock in the morning when the Knowles family drove through the Nullarbor Plain in the southern part of Australia. 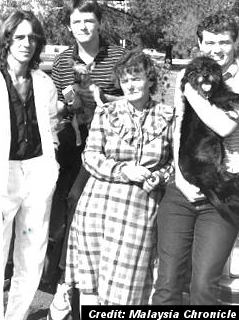 Faye and her three sons Patrick, 24, Sean, 21, and 18 year-old Wayne were traveling with their two dogs when a strange light up caught their attention. Sean was driving the family’s blue sedan with Patrick as his co-pilot. As the light got brighter the two of them joked that it was a spaceship landing on the highway. Sean stepped on the gas to try and catch up to the blinding light for a better look. 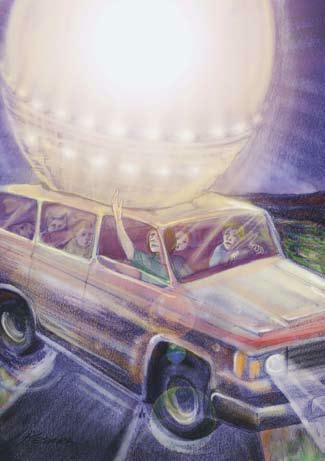 As they got closer, a bright white beam of light came from within the glowing object and moved along the front of their speeding vehicle. The Knowles described the light as being one meter wide and having a slightly angular shape with a yellowish center. The knowles began to panic. The bright object then began to move, floating right above the sedan. In a fit of panic, Sean swerved onto the opposite lane almost colliding head-on with an oncoming vehicle. The occupants of the station wagon swerved to avoid the collision. That’s when the Knowles noticed that the light was no longer in front of their vehicle or above them. It had given chase to the other vehicle instead. Uneasy but more curious as to what the bright object was, the Knowles made a quick U-turn on the highway to give chase to the light and see if the people in the other car were okay. As their car began to pickup speed and catch up to the fleeting car and object, a dark feeling washed over Faye and her sons. They decided to abandon the idea of the chase and stopped the vehicle once more for another U-turn. They decided they should continue on to their destination and report the incident once they felt safe. Continuing along the stretch of Australian highway between Madura and Mundrabilla, their thoughts began to finally catch up to Faye and her sons. What was that strange light? Had they seen a UFO? Was it chasing them? As they raced to their destination, believing that their encounter was over, they heard and felt something heavy land on top of their car. Whatever was resting on top of their car was heavy as it weighed it down, making it difficult to control. That’s when Faye and her sons felt the sensation of being elevated. There were no sounds and no lights visible, yet Sean was still having difficulties maneuvering the vehicle. Faye decided to roll down her window and stick her hand out to feel if there was something on the roof of their car. She felt something soft, almost rubber-like. She reported that it was hot to the touch but it did not burn her skin and that it was covered in a very fine dark dust. A cloud of that dark dust blew in through Patrick’s window bringing with it the malodorous smell of decomposing organic matter. The smells of dead bodies, as they put it. In that moment a high pitched buzzing sound rang through their ears, making the two dogs go into a barking frenzy. The Knowles began to feel disoriented and can hear each other’s scream become slower and lower in pitch. “I felt like my brain was being sucked out…” Patrick Knowles told the reporters. “It felt like something was going into our heads…” Faye Knowles added. They had lost track of time and space for an unknown amount of time. What the Knowles remembered next was their car’s tires making contact with the asphalt and the sound of one of their tires blowing out as it touched down on the road. Sean managed to bring the car to a halt on the side of the road before he and his family fled in terror. lights or any other vehicles. They decided to quickly change their tire and hop back on the road to the nearest town. They arrived in a town called Mundrabilla and pulled into a gas station. That’s when they met Mr. Graham Henley. A truck driver who had seen the strange light on the same road just minutes before. He had been observing the light on the highway for a good 5 minutes but cannot remember seeing any other lights near or beneath the hovering object. “It looked to me like a big fried egg hung upside down.” is how Mr. Henley described the light. Mr. Henley noticed the strange indentations on top of the Knowles’ car and the strange film of dust that covered it. It was the same dark dust that the light had emitted back when it took control of their vehicle. 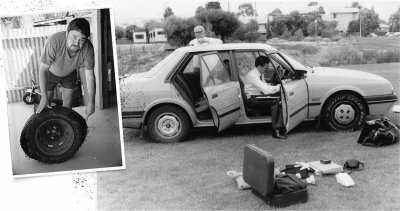 The Knowles decided to alert the local police so they drove to the town of Ceduna where they were interviewed by the local police. Sergeant Jim Furnell of the Ceduna Police department investigated the case. He was able to confirm to reporters that the Knowles were visibly shaken by the experience and that the car did have the indentations on its roof and some of the fine, dark dust. 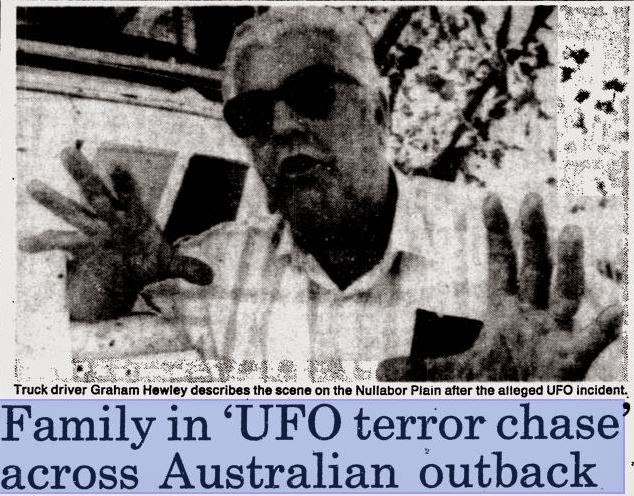 To this day, there is no explanation as to what the Knowles family encountered that early morning on the long stretch of highway between Mundrabilla and Madura, Australia. A huge flying fried egg with extra sulfites and black pepper? WTH kind of UFO is that? Needs a soundtrack. Maybe the Chicken Dance song. A.U.F.O.A – aims to provide a UFO investigation service for Australia, and is dedicated to the pursuit of professionally and scientifically reviewing all UFO cases which are received. opinions at times, We will leave the final judgment to you.